MedVisor|dental ™ puts accurate three-dimensional dental animations at your fingertips to help you translate the complexities of dentistry for your patient. Incorporate your patient’s information directly into your explanation, and utilize MedVisor|dental ’s drawing and notation tools to further personalize your discussion.Your patient’s level of interest and understanding will be dramatically enhanced. MedVisor|dental ™ ushers in a new era in patient education, elevating it from a passive waiting-room pastime and supporting its importance in the patient's healthcare choices. Patients who understand their diagnoses and treatment options are more likely to make sound decisions regarding their dental health. MedVisor|dental is interactive. Customize explanations with specific notations. Incorporate data unique to each patient, from x-rays to intraoral photos. Clarify hygiene instruction to convey specific techniques with 3-D visuals. Developed with dentists for dentists, MedVisor|dental 's highly detailed animations augment your professional counsel in a universal language. The result? Patients achieve the clarity that leads to understanding and acceptance of your treatment recommendations. MedVisor|dental animations are of the highest quality and accuracy giving dentist the edge that they need in educating patients and giving every patient what they deserve, understanding. Easily integrate MedVisor|dental technology into your existing office. MedVisor|dental can be tailored to fit your needs, whether you want to install MedVisor|dental on an existing system, bundle it with an ultra portable tablet PC, or a solution in between. The perfect union of portablility and accessibility. A fully featured PC running Microsoft Windows™. The size of a clipboard, the power of a PC and the ability to write directly on the screen with a stylus. 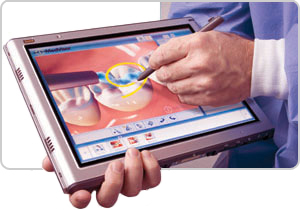 Upgrade your Operatory PC with a pen-abled LCD Monitor. Write directly on the screen. Integrates into existing chairside systems. Use a PC and a chair side screen with a penabled pad. For purchasing and pricing information about MedVisor|dental, contact one of our distributors by clicking the link below.